Although the primary purpose of a mailbox is to receive incoming mail and packages, it’s also the first thing people see when entering your driveway and walking toward the front door. You can go with an “ordinary” look, or you can display this AdirHome Steel Medallion Gold "Briefcase" Mailbox and look like royalty. The eye-catching, medallion gold finish, along with the bold handle, certainly sets the AdirHome apart from those ho-hum mail receptacles found in front of most residences. It’s even generously sized at 14.3” H x 12”W x 7.2” D and boasts a full-dimension opening to accommodate larger packages. To supply long-term durability and use, this mailbox is expertly crafted using solid steel construction. A scratch- and weather-resistant finish increases the long service life, ensuring that this accessory will hold up against the elements, as well as everyday wear and tear. Welcomed by postal employees, this chic piece also boasts a briefcase-inspired, lift lid. The generous lid is outfitted with a "briefcase grip" handle, making it easy to access the compartment to deposit large and small pieces while also protecting the contents inside from the elements. For added convenience, the mailbox comes with included hardware and pre-drilled holes for easy mounting onto any wall, post or fence. You just need to decide whether you want to be a commoner or you want to stand out from the crowd. If you chose the latter, proudly display this “Briefcase” Mailbox in front of you home so you can shine. GALVANIZED MAILBOX. Generously sized at 14.3" H x 12"W x 7.2" D and boasting a full-dimension opening, this mailbox readily accepts larger packages. The stylish design and eye-catching gold-tone are sure to create an interesting focal point wherever it's placed. RUGGED CONSTRUCTION. Made using solid steel construction to furnish long-term durability and use, the AdirHome will last you day in and day out. It also features a scratch- and weather-resistant finish to hold up against the elements and everyday wear and tear. EASY ACCESS. The briefcase-inspired lift lid will be welcomed by postal employees as a super easy way to deposit large and small pieces, while also ensuring that personal contents are protected from the weather. BOLD APPEARANCE. 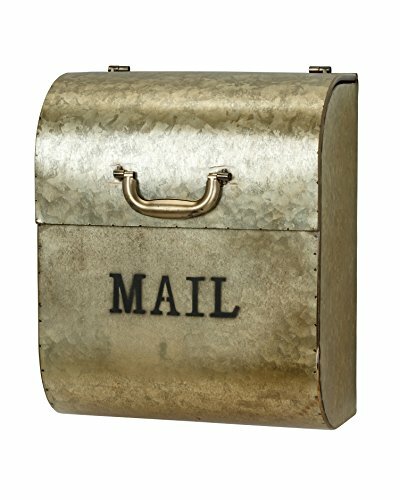 This attention-getting mailbox boasts a large size, stylish "briefcase" shape and a medallion gold finish that easily sets it apart from the commoners. A large "MAIL" imprint and chic handle complete the bold look. HARDWARE INCLUDED. For easy installation, the "briefcase" mailbox is outfitted with pre-drilled holes and comes complete with screws for easy and secure mounting onto any wall, post or fence. If you have any questions about this product by AdirHome, contact us by completing and submitting the form below. If you are looking for a specif part number, please include it with your message.